Tom Moody | Thu, Nov 10th, 2011 9:57 a.m. Neither this post nor Joanne McNeil's paragraphs describing The Download mention that Ryder Ripps has deleted his Facebook account and this download of all his data is connected to that. That's kind of a big deal, especially since Ripps has been a Facebook love/hate supporter for some time. McNeil mentions that an artist named Kevin Bewersdorf deleted his data from his site once and murkily suggests that Ripps' The Download has something to do with that. This isn't even a case of "burying the lead"--hiding it, more like. But why? Zoë Salditch | Thu, Nov 10th, 2011 12:58 p.m. Thanks Tom, that's a valid point – we've updated The Download page. rene abythe | Fri, Nov 11th, 2011 7:32 p.m.
Ryder Ripps | Sat, Nov 12th, 2011 11:37 a.m.
Tom Moody | Tue, Nov 15th, 2011 11:18 p.m. 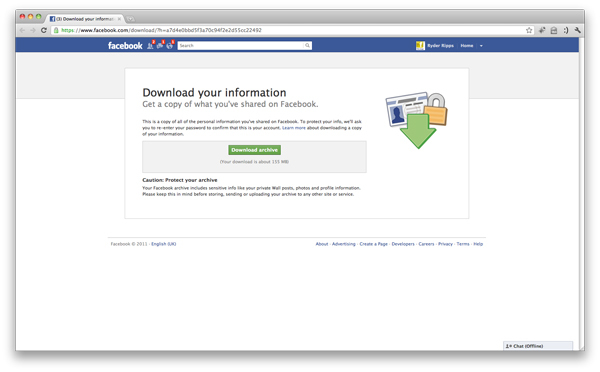 Since Ryder has reactivated his Facebook account the download of his data now seems like a bit of a hollow stunt. We're back to Joanne McNeil's meditations on temporality as the justification for this artwork but now she's taken her name off those paragraphs!